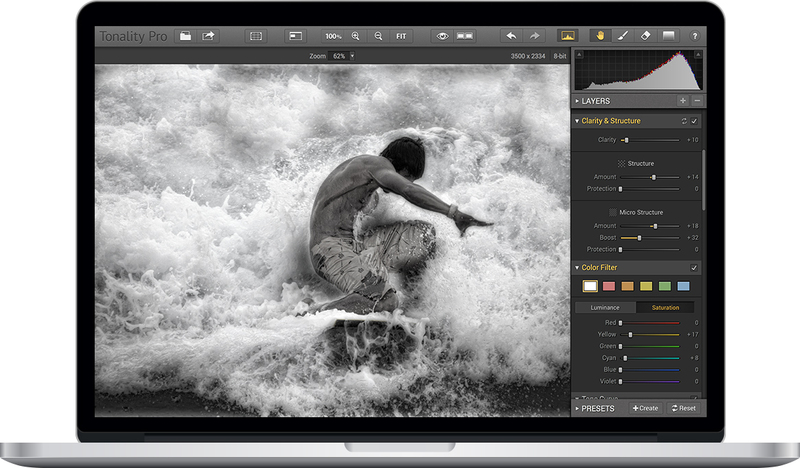 Macphun Software, a leading photography app developer with over 20 million users worldwide, has recently announced the release of Tonality, the fourth addition to their popular suite of easy-to-use photo programs for Mac users. Tonality uses a proprietary 16-bit RAW processing engine, advanced imaging algorithms and a comprehensive set of unique digital darkroom features that enable photographers to create the highest quality black and white images with little work. With Tonality‘s cutting-edge technology, the app produces black and white images that most other programs can’t match. Starting with professionally inspired presets, Tonality includes features like layer-based image editing, adaptive exposure and smart contrast, overlay textures, advanced clarity and structure detail, grain and film emulation, adjustment brushes and a variety of finishing tools. Lastly, each layer includes separate opacity controls, blending modes and preserves color data of the original image. “For many photographers, crafting dramatic black and white images is their favorite form of creative expression yet presents uniquely difficult and time-consuming challenges,” said Paul Muzok, CEO of Macphun. “We designed Tonality to overcome those challenges, and be not only the best app for those passionate about monochrome image making but also appeal to the casual photographer who is exploring the genre,” Muzok added. Interested? Tonality is as an electronic download from the Macphun website as well as the Mac App Store. Also one thing to note is that there are versions of the software are available — as a limited time special offer on the Mac App Store, the standard version of Tonality is priced at $17.99. Tonality Pro, which adds the ability to run as a plugin to Photoshop and more, retails for $69.99. Entries (RSS) | Comments (RSS) | 85 queries in 0.749 seconds.